Baha Mar may be up and running, but its legal woes are far from over. The former owner, BML Properties Ltd., is suing the Chinese contractor behind the luxury hotel mega-resort development in Nassau, the Bahamas, for “massive fraud” to the tune of $2.25 million, according to a report in Reuters. The resort opened in April of this year, but only after a number of setbacks postponed its planned debut, which had been set for late 2014. The property languished in bankruptcy then endured a drawn-out battle over ownership before being sold to Chow Tai Fook Enterprises, the current owner and operator of the mega-resort. The most recent lawsuit was filed in New York state court in Manhattan on Tuesday by BML Properties Ltd., owned by Sarkis Izmirlian, the original owner of the Baha Mar resort. The 259-page complaint alleges that the contractor, China Construction America (CCA), engaged in a self-enrichment scheme that ultimately sank the $3.5 billion mega-resort project, which wound up in bankruptcy in 2015. “The scheme was based on CCA’s efforts to falsely create the appearance that it was working toward an on-time and on-budget opening in December 2014 while knowingly and fraudulently concealing its real intent not to construct the Project on time and on budget and in the process extort more money than it earned and was due,” states the lawsuit. The court filing is only the latest in a series of lawsuits filed by BML and Izmirlian. Izmirlian fought to regain ownership of the resort after Baha Mar ended up in bankruptcy. Ultimately, he was unsuccessful and the property was transferred to Chow Tai Fook Enterprises. 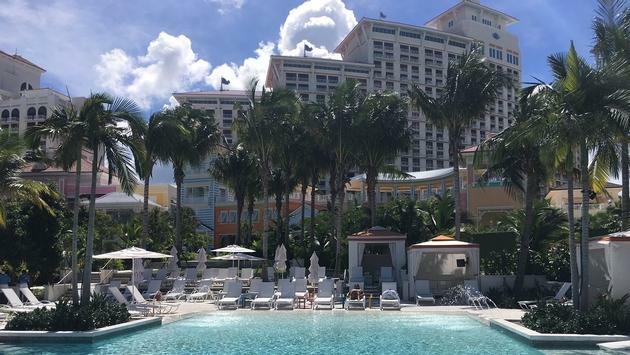 The official opening took place in June of this year and the mega-resort is now home to a Grand Hyatt hotel, the 200,000-square-foot Baha Mar Casino, the Baha Mar Arts & Convention Center, the Royal Blue Golf Club and the SLS Baha Mar. The mega-resort will welcome its third hotel, the Rosewood Baha Mar, in 2018.